I'd like to say hello to all Guinea Lynx forum users. I feel as if I know you, because I have been reading the forum regularly for years. For a time I have also been exchanging e-mails with Lynx. I must say that Guinea Lynx site and forums have been enormously helpful to me and my fellow cavy lovers in Poland. I am a member of a guinea pig rescue organization in Poland, and our group uphelds the same values as you. We have been active for seven years, although only for five years as a registered formal association. We do not have a rescue as a building, we operate only as a network of foster homes all over the country, and coordinate actions mostly by internet. We have a webpage and a forum with a funny name of Caviarnia. It is a sort of a pun, referring both to the name Cavia porcellus and to the Polish word "kawiarnia" (the two words are pronounced the same in Polish), which means "a cafe". So it is an internet cafe, where guinea pig lovers can talk about their favourite animals. I have three boars of my own, and currently I foster two young guinea pigs. Only two, because usually I have more fosters or guests for holidays, so I usually have about eight to ten cavies in my apartment. I have three very nice male cavies, two peruvians and one semi-long haired piggie. The almost smooth haired one is my original piggie, the oldest (he is seven), and my favourite. His name is Bobczys&#322;aw but I call him Bobek or Bobcio. It means "Famous for his beans", of course, beans as poop :). So he is my "glorious bean maker" or just "little bean". My other original piggie died a little more than a year ago of kidney failure. His name was Puszek or Pusio (Fluffy) and he was also a smooth, semi-long haired tri-colour (TSW) cavy. He was around seven, when he died. The older peruvian is a large, heavy, mostly agouti coloured boar. I suppose he could be around five, but he doesn't show any signs of aging, besides the beginnings of osseous choristoma in his eyes. He is gentle and laid back, just as the other two, but I think he is not all there :). He is definitely not the brightest bulb in the drawer, but he makes it up by being quite gorgeus. His original name was Amant, which means "a gorgeous guy/a hunk/a lover", but now I call him simply Kud&#322;aty, which means Shaggy. My third piggie, the youngest one, is about a year old, and his hair is soft and silky. His name is - don't laugh - Kurczak, which means Chicken! He was my foster and at first I didn't know what to call him. I got him around Easter as a possibly two month old piggie, and his hair was incredibly disheveled. It was still pretty short, every strand of different lenght and growing in a different direction. He looked like a partially plucked chicken, although he was in a good shape and had no really bald areas. He was as funny and ugly as a guinea pig can be. My Bobcio loved him from the first sight, and since I saw that he was feeling lonely without his old time pal, Pusio, and Kud&#322;aty was evidently not as much fun, I decided to keep Kurczak. Few months later Kurczak's hair grew long and finally he started to look more like a regular guinea pig. He has a curiously small head and large, stick-up ears, like an elephant :). The fosters are six month old PEWs. They could be called himi wannabes, because their ears are grey rather than pink, and some of their paws are also a shade darker. PEWs are, unfortunately, not favoured by most people, and it is very difficult to find homes for them. To make things worse, these two, Raban and Rumor (loosely translated as Rumpus and Noise) are very skittish and not very fond of petting. They have been living with me for four months and nobody has wanted to adopt them yet. However, we do not lose hope :). My own piggies are free-rangers, that is they have a C&C cage, almost always open, and the fosters live in a 6 x 2 grids C&C. Coroplast is expensive and not very easy to get, so I use only fleece with a litterbox, and incontinence pads. I also sew cosy saks, cuddle cups and fleece tunnels for my own piggies and the piggies of my friends on the forum. Thank you for providing a rescue for these little guys. I forgot to explain the title! I live in &#321;ód&#378;, a city which name translates as "a boat". These are my current fosters. Welcome. Thank you for providing a foster home for these lovely looking pigs. As well as 3 of my own I also foster. It's so rewarding to be able to help get them back on the road to recovery. Your pictures are great! So glad you introduced yourself to the board. 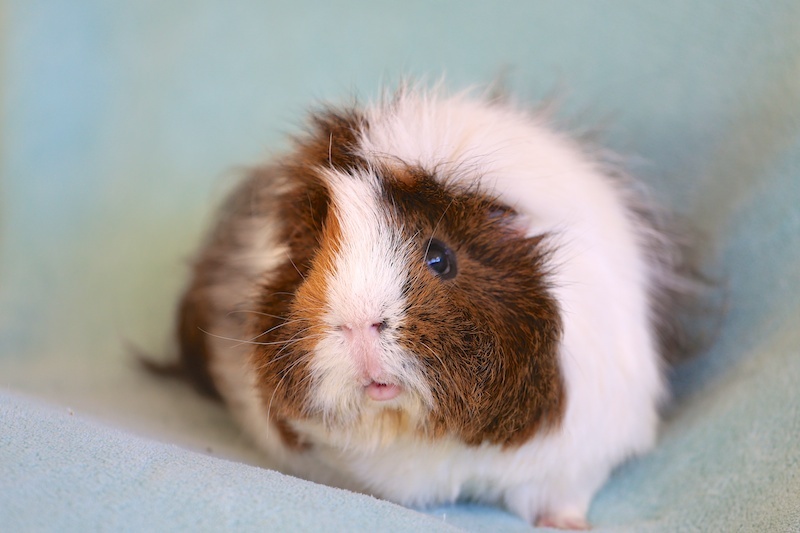 It takes someone with dedication to foster and help guinea pigs needing homes. I have to add Poland to my pignapping world tour. They are very cute. How lovely to meet these handsome piggies from Poland. The fosters are adorable as well. Welcome to the board! Your piggies are all gorgeous!!! GPIG - yes, you've remembered it right! Pusio was so pretty and cute, he featured in Caviarnia calendars for a few years in a row. This also Bobcio, he is red on one side and mostly black and white on the other. I'm glad you have come on board with us. Thanks for being so dedicated to piggies and giving them a safe place to land! Your pigs are soooo cute. Pusio has that mischievous sparkle in his eyes. . . Welcome! The Polish piggies are lucky to have you and your dedicated team to look after them. Your boys are very handsome, the photographs are lovely. I'm looking forward to hearing more about them. jacqueline: Pusio is sorely missed, both by me and by his original pal, Bobek. For a long time after Pusio's death Bobcio walked around the room and wheeked loudly. It was heartbreaking. Then he learned to walk out of the room, which he hadn't done all his life, and wandered to another room, where the fosters live. Last year I petsitted some lovely female skinnies, and this Christmas I had a baby pedigree US teddy and her smooth haired older friend over at my place. Bobek was delighted with their visit. He found his way to my bedroom where the girl's cage was, and he sat near the cage for hours, clearly fascinated. I must say that he was quite the gentleman - he didn't rumblestrut or produced boar stink. He only purred, wheeked, looked into the cage or simply lied down by the cage. I put a bed for him there and he nibbled at the girl's hay. At night he usually slept in his own bed in the other room. However Cookie and Muffin were not terribly impressed and they mostly ignored Bobek :). Very cute!! I love the colors of your piggies and the chaotic hairdo's! Welcome aboard! You have lovely pigs. Kimera - I'm always touched by displays of an emotional life in our pigs. Every time we've had a death, the mourning responses on the part of the surviving pigs brings me to tears. Right now I have Kramer, who's the "seeing eye" pig for my two boys with LWS. He's quite protective, and has been know to drag the pellet dish closer to Dash so he could eat better. Bobek seems like a similar kind of sweetheart. I hope you'll continue to share piggy stories! Bobcio, my sweet little capybara :). Pusio's portrait from a calendar a few years ago. And this a portrait of my piggies by the Caviarnia's talented artist, Kakazuma. She posted some of her cavy comics here: http://www.guinealynx.info/forums/viewtopic.php?t=67875&highlight= but I think she got disheartened by the lack of interest and comments :). She draws the pictures and writes the stories and I try to translate them into English, to make the comics more accessible to the public. You can easily find her full gallery at Facebook just by looking up "kakazuma". Some of the captions might not sound exactly right in English, so if you have any comments, please do write, and we will try to change the words or phrases. Kakazuma draws portraits of guinea pigs (and occasional mice hamsters and dogs) belonging to the members of our association. She is also responsible for the webpage art, calendar art and the design of magnets and other small gadgets. Her most recent work are Valentine cards, of course with guinea pigs.